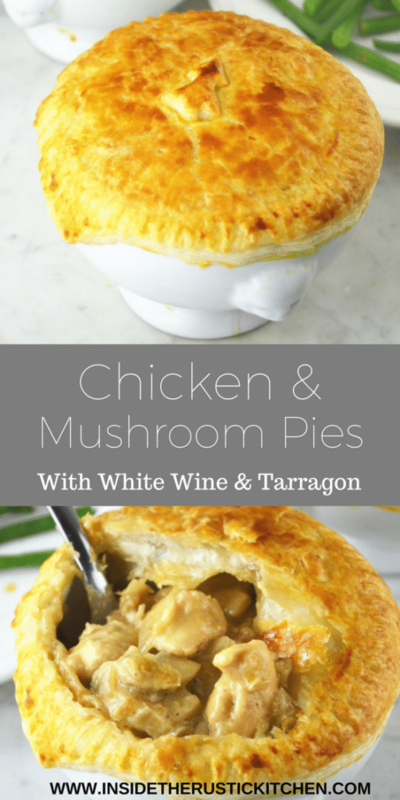 Try these Chicken and Mushroom Pies for a deliciously comforting weekday meal this winter. They are so simple and taste incredible along side some creamy mashed potatoes. Hello fellow foodies, did you all have a nice relaxing weekend? I hope so because I had so much fun! We had a pretend “Christmas Day” for my friend that will be celebrating in Australia this year where her family are from. Since she’ll be staying in a hotel and it will be Summer over there she was a little concerned she might not feel “Christmassy” enough so we were sure to celebrate before she leaves. We started with a wonder around beautiful Siena and stopped for a ginseng coffee which is so popular here in Italy. It’s very sweet and so delicious, much more festive than a regular espresso or cappuccino. Then we headed home where of course I have all the decorations up already, well everything but the tree (they’re not even on sale here until the first weekend in December, Bah Humbug). We got the Christmas songs on the go and started our first craft of making Christmas crackers which was so much fun. We made sure not to peek at the jokes before hand and stuffed them with little chocolates and party hats. Then we continued the festive fun with making the cutest gingerbread house which you can see on my Instagram page. It was so much fun and might I say still standing today unlike last years that had caved in by the morning. The night continued with a delicious meal of salmon wellingtons (I’ll try post this asap because it was SO good), more food and lots mulled wine. 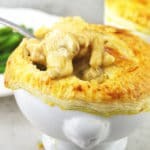 It has definitely kick started the holiday celebrations in the best way possible which brings me to this lovely recipe, Chicken and Mushroom Pies. Look how creamy and delicious it is…. I love making little individual pies but it works just as good in one big dish covered in pastry. 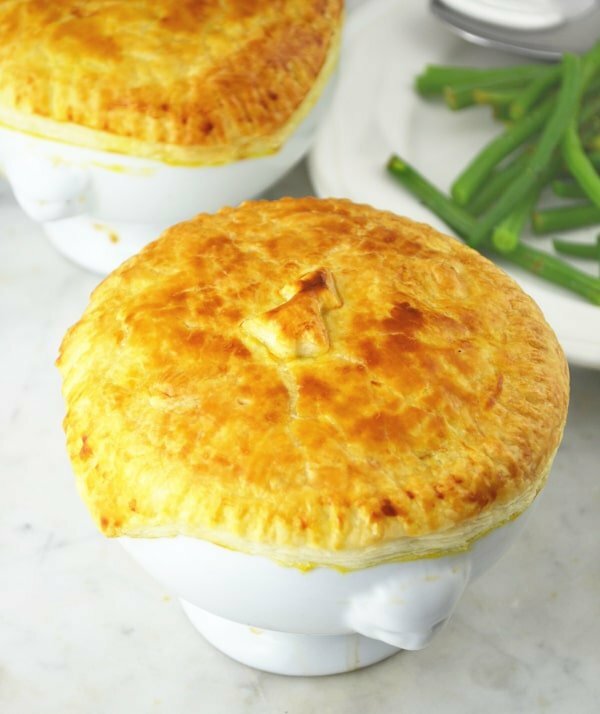 The easy thing about this recipe is that everything is cooked in one pan then transferred into little pie dishes before being topped with pastry and brushed with egg. Because everything is pretty much cooked in the pan you only need to wait for the puff pastry top to get all puffed, golden and delicious and they’re ready! So perfect and so comforting. I love to serve these with fluffy and creamy mashed potatoes and green beans, just cooked through then drizzled with lemon juice, salt and pepper. Also since I was full of Christmas cheer I used a small tree cookie cutter to place on top of the pies. Why not have a little fun with hearts, stars, snowmen….whatever you can think of to make it a little more festive. You can also FOLLOW ME on FACEBOOK, TWITTER, INSTAGRAM and PINTEREST to see more delicious food and what I’m getting up to. Add around 3 tbsp of olive to a large frying pan under a medium heat.Cut the chicken breasts up into rough medium sized chunks and add to a bowl with 2 tbsp of flour, salt and pepper. Toss the chicken so it's coated in the flour then add to the pan (dusting off any excess flour). Brown the chicken on all sides for a couple minutes then remove onto a plate, set aside. Add another tbsp of olive oil to the same pan. Finley chop the onion and add to the pan. Finely slice the mushrooms and add those to the pan after a minute. Lightly fry the mushrooms and onions for 2 minutes then add the chopped garlic. Stir everything together for another minute. Add the white wine to the pan and let reduce by half then add the stock cube and water. Add the chicken back to the pan and stir occasionally until the sauce is starting to thicken. Once the sauce had started to thicken add the mascarpone and tarragon with a sprinkling of pepper. Stir together for 1-2 minutes. If using individual pie dished use these as a guide to cut out the pastry tops. Make sure to leave 1cm extra around the rim. Alternatively just use a normal baking dish and trim the pastry form the eges. Cut out any decorative shapes at this point too. 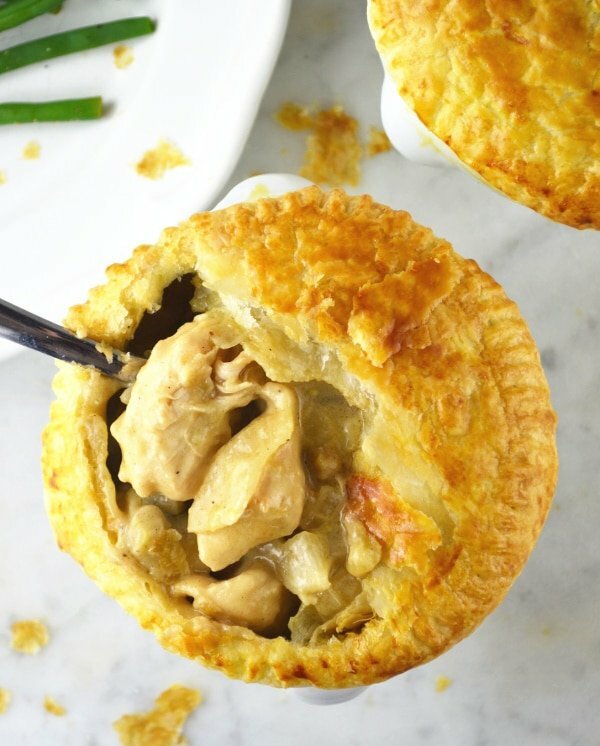 Divide the chicken and mushroom mixture between the pie dishes on into a baking dish. Brush the edges of the pastry with a little beating egg then top the dishes with the pastry. Use a fork to seal the pastry. Add the pastry trees/shapes then brush the tops with more beaten egg. Make a few small pricks in the pastry for steam to escape with a shape knife. Bake in the oven until the pastry is puffed and golden (around 25 minuteServe with mashed potatoes and green beans. Absolutely delicious, we all loved them and the recipe is very simple. Thanks! These look like such a wonderful comfort food. I love making potpies! I’ll have to add this to our rotation. Thank you Nicole, comfort food it is indeed! What a fun time to celebrate early with your friend. Love the idea of that coffee too. Never seen it before. Next time I go to Italy I’ll have to seek it out. You know, I love pot pie, but have never made my own!! I think that is about to change. That pastry is irresistible. These pies look gorgeous! Just the thing for a special celebration. We live in Australia & I guess we’re quite used to Christmas being in summer on this side of the world, but I imagine it would seem a little strange coming from a life of winter Christmases. Thank you so much! Well I wouldn’t complain if I was soaking up the sun and having a Christmas Day BBQ. It sounds just as fun ? This is perfect for breakfast , sounds creamy and I love pies. This is great idea for snack too. Yum! These pies look adorable and delicious. Can’t go wrong with puff pastry and a creamy filling! I hope your friend enjoys Christmas in Australia. It is a different experience having a summer Christmas and I can assure you that food there is just brilliant. These pies look very inviting and this sounds like it was quite a send off. It’s a lovely pie recipe and you are soooo sweet throwing an early Christmas for a friend. Oh! 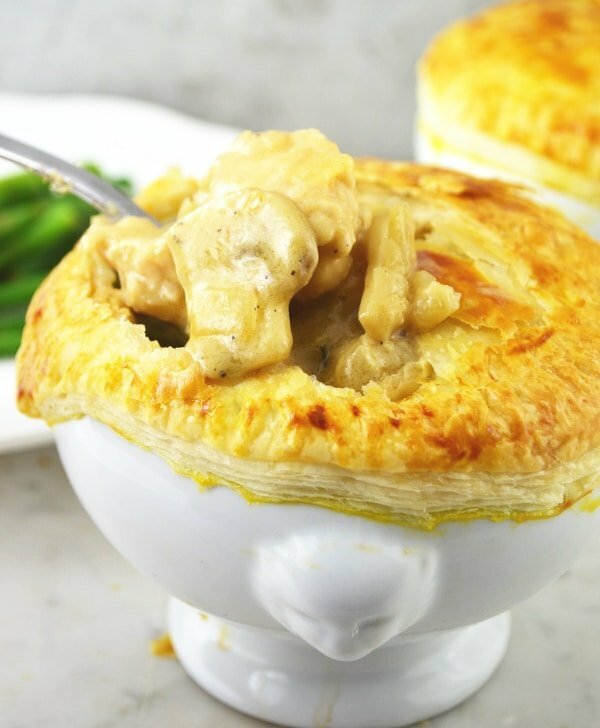 Your pot pie looks so good, with that puff pastry crust and creamy chicken and mushrooms inside! Thanks so much ☺️ glad you like it!